NCPs Project: at orphans’ side. 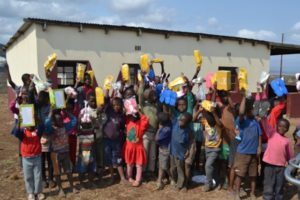 Orphan Aid Program, under Caritas Swaziland supervision, implements a lot of projects at most vulnerable children’ s side in the Country. Today, we want to start sharing with you something about the NCPs Project. There are 62 Neighbourhood Care Points (NCPs) located in the Lubombo Region, who support 2310 children: 1210 boys and 1100 girls. The children get services like informal education, feeding, health hygiene, psycho-social support and Early Child Education Development (ECED). All these activities are implemented through the hard and valuable service of ours 310 Caregivers, who were identified in local communities and, then, trained and monitored in all areas of intervention from our team. The last training they had was on human trafficking issues. Our project is supported also by donation, and, for this reason, we also are grateful to the Catholic Church from Taiwan, Diocese of Taichung, and the Taiwan Children Fun for Families (TCFF) who supported us with food, clothes and shoes.